These super-quick and easy cheesy bites, based on a recipe by Hugh Fearnley-Whittingstall, can be made in advance up to the end of stage 5. They freeze well too. Freeze uncooked on a baking sheet until solid. Then wrap the palmiers in cling film and foil and store for up to two months. Cook from frozen until hot and golden brown. Add 10 minutes to the cooking time. Peel and finely chop the shallots. Wash the thyme, strip the leaves and finely chop. Beat the egg. Grate the cheese. Melt the butter in a small frying pan. Add the shallots and thyme leaves, sprinkle with a little salt and soften for about 6-8 minutes, stirring frequently. Remove from the heat and leave to cool. On a floured surface, unroll the pastry and brush with the beaten egg. 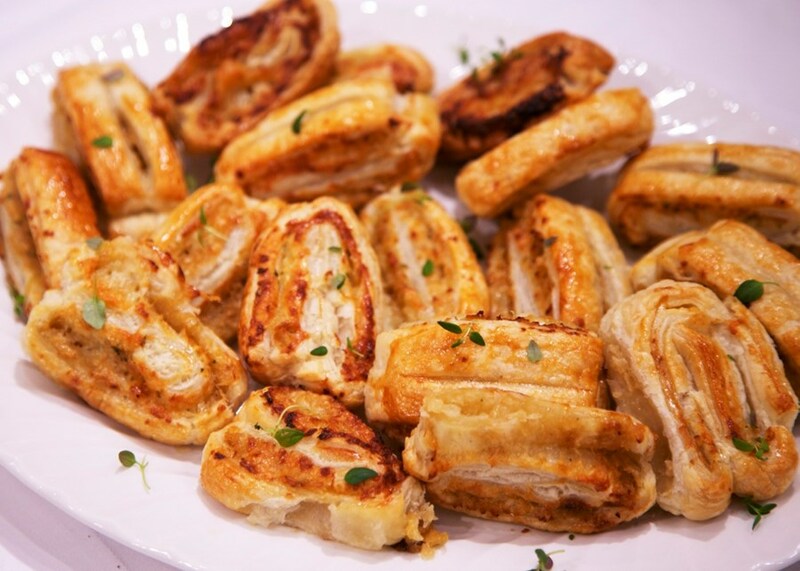 Scatter the cooled shallots and grated cheese over the pastry, add a generous grinding of black pepper and fold the long sides over towards each other to meet in the middle. Brush a little egg down the centre to stick the two halves together so you have one long, fat strip. Chill the pastry in the fridge for 15 minutes. Grease and line a baking sheet with baking parchment. Cut the pastry roll into 30 slices and lay them cut-side down on the parchment. Brush lightly with the remaining beaten egg. Bake for 10 minutes or until risen and golden brown.